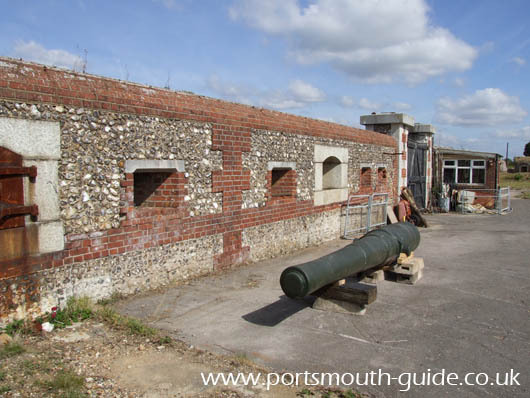 The remains of Eastney Fort East are located in the grounds of the Royal Marines Museum on the seafront at Eastney. Work started on Eastney Fort East and West in June 1861 and was completed in March 1863 at a cost of £17,435. They were intended to flank the barracks and comprised of two openwork batteries with twelve gun positions each. The outer walls were constructed of brick with galleted panels of flint. A brick lined and vaulted magazine was built below ground in each fort. Both forts have been heavily altered, particularly Eastney Fort East, which now contains several brick buildings from the 1930s and 1940s when the fort was used by The Signal School for development of radar and, during the war, by the Admiralty Signals Establishment for naval radar. Each battery had ten embrasures and two barbette positions, but was never fully armed, the maximum number of guns provided being five 7in Armstrong and one 68-pounder to each battery. In the early 1900s a 6 inch breach loading gun on a hydro-pneumatic carriage was installed with a range of 8,800 yards. Similar guns were installed at Eastney Fort West and were controlled from the Fire Commander’s post in Eastney Fort East. The Artillery Volunteers looked after the guns at Eastney Fort East and West and it the 1st City of London Artillery Volunteers exercised in the forts in 1889 and 1890. In 1936 Eastney Fort East was used for radar development and continued to be used for military purposes until 1989. It is hoped to open the fort to visitors on completion of restoration of the fort. The parade will be used for re-enactments and military vehicle displays during special events. The fort will form part of the museum's interpretation of the history of the Royal Marine Artillery. For more details about the Fort and for pictures of the restoration work on the fort have a look at www.palmerstonforts.org.uk/east.htm. For more details about the Royal Marines Museum please click here.